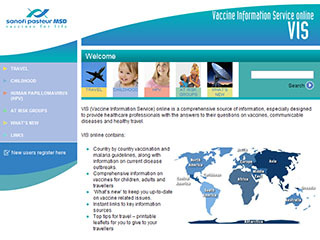 VIS (Vaccine Information Service) online is a comprehensive source of information, especially designed to provide healthcare professionals with the answers to their questions on vaccines, communicable diseases and healthy travel. This is a secure web based application with 20,000 registered users, hosted as part of the main UK corporate website. The new design features the company's primary colours and the curve of the logo. Each section (travel, childhood, HPV, at risk groups, what's new etc.) have their own colours to distinguish them apart from each other. The functionality has also been improved within the country recommendations section, making it even easier for healthcare professionals to choose the appropriate vaccines for their patients before they travel throughout the world. The A to Z resource has also been improved with downloadable multimedia documents and guides.